Inspiration from those who remain true to their art- Robert Irwin, Cecil Taylor and Joseph Kosuth | Jon Katz, P.C. Being an artist is not an easy path for earning a living. Chicago blues slide guitar great J.B. Hutto became a funeral home custodian for eleven years after a nightclub patron grabbed his guitar and smashed it over a man’s head. Hutto returned to performing full time after his mentor Elmore James passed away. True artists cannot long stay away from their craft. When one remains true to his or her craft, the payoffs will come. In his eighties, music great Cecil Taylor was recognized for his uncompromising devotion to his craft with the $500,000 Kyoto Prize. Light and space artist Robert Irwin, now in is eighties, long ago abandoned the financial certainty of an art studio, and ended up better defining his art and himself as an artist. Conceptual artist Joseph Kosuth now sees some of his simple-seeming neon and other works sell at auction for over $100,000. Enhancing the inspiration of all of the above artists is my experiences with them and/or their works. I met J.B. Hutto in 1981 when he performed at my college, and a few months later at a Bridgeport, Connecticut nightclub when I chose Hutto and his band as the subject of my ethnomusicology class paper. Having already had peripheral familiarity with him, Cecil Taylor came front and center to my attention starting in 1999, when I first saw him perform at the Library of Congress, and then was blessed with joining others at his hotel room after Cecil’s performance through our mutual friendship with the now-late Trudy Morse, and then sitting next to Cecil at Trudy’s subsequent birthday celebration. My brother Peter introduced me to Joseph Kosuth when Peter was in town, through Kosuth’s 1992 “A Play: The Herald Tribune, Kafka and a Quote,” Peter himself has made a career in the art world, currently executive director at the Reversible Destiny Foundation, which pushes the envelope of artistic meaning and possibility starting with its very unique website and even more mind- and experience-expanding Yoro Park in Japan (see also here and here). 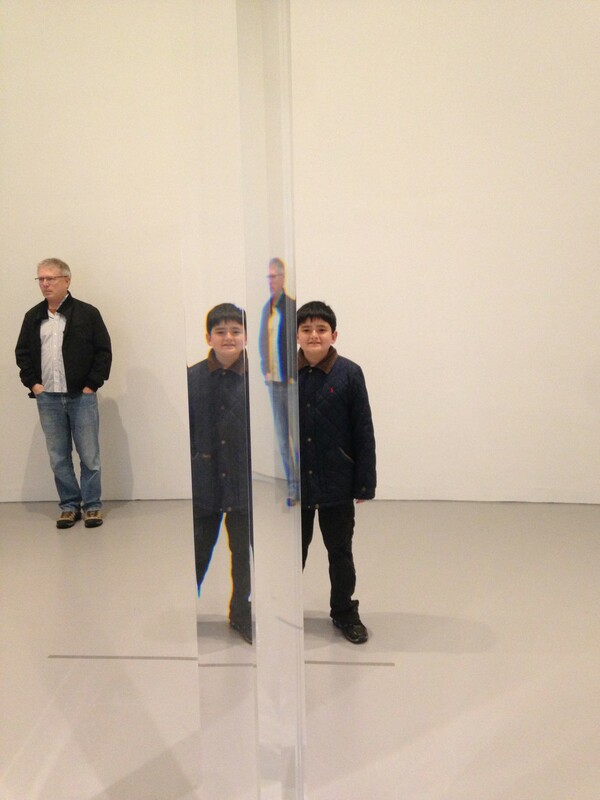 Today, my family and I nearly bumped into Robert Irwin‘s magnificent “All Rules Will Change” exhibit that only will be at the Hirshhorn Museum in Washington, D.C., when I checked the Smithsonian’s exhibit listings online as we considered somewhere to visit after lunch on this rainy day. As much as an audience only truly experiences any artist by viewing their original works, that proves all the more true for Irwin’s “All Rules Will Change”, where a seeming all-white painting turns into dots of two colors on white as one gets closer to the painting, and where paintings seemingly of only one or two colors come alive by seeing their textures from the side. Irwin’s genius comes all the more alive through his work with light, shapes and space (see a sample slide show), with an example in his acrylic column pictured above. Near the end of the Irwin exhibition is a fascinating 1973 interview of the artist, explaining his leaving the artist’s studio to apply his craft with spaces, NASA and beyond. Irwin treats each question and answer as vital, no matter how elementary the question may seem, and boils each answer down to essential simplicity, which clearly is also important for a trial lawyer on the path of persuasion. Relating all of this back to my criminal defense work is the inspiration of the foregoing artists and other great artists for me to continue to remain true to my craft and to work to transcend the apparent boundaries to achieving victory for my clients. Statistics generally have most prosecutors obtaining high conviction rates, but, as Irwin underlines, “All Rules Will Change,” and criminal defense lawyers can unblock seeming barriers in order to achieve great results.